Some evidence suggests reclining at your desk is a better option than sitting at a 90-degree angle (though I found it challenging ). 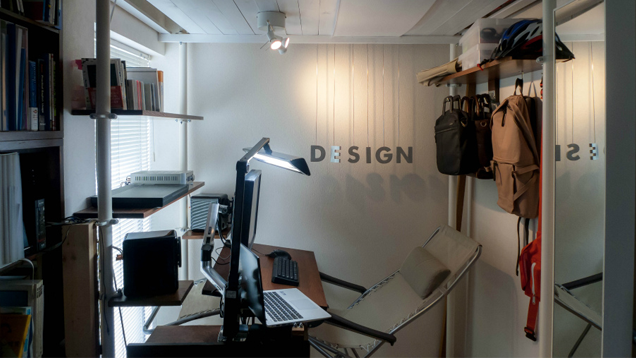 This workspace features a desk that can be used on a recliner chair or as a standing desk. Should I Sit, Stand, Run, or Recline at My Desk? Should I Sit, Stand, Run, or Recline at My Desk? Should I Sit, Stand, Run, or Recline at My Desk? Flickr user Designcutter built this desk and shelving system with IKEA poles—without fixing themt ot he room because it’s a rental. Although it’s a small, narrow space, there’s a lot of flexibility in the room, with the monitor arm allowing for viewing anywhere in the room and, of course, that reclining option. You can view more photos of the minimalist workspace at the link below.